Commercial full-size cart is a complete system solution for housekeeping in the hospitality industry. Standard equipment includes vinyl bag, bumpers, vacuum holder for up to 12"-wide vacuum. Includes under-deck shelf and molded-in tool organizer on back. Full-size cabinet offers exceptional storage space and optional adjustable middle shelf. Compact, so requires less floor space and maneuvers easily in tight spaces. With commercial grade molded construction. 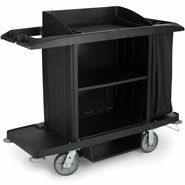 Commercial full-size cart is a complete system solution for housekeeping in the hospitality industry. Standard equipment includes vinyl bag, bumpers, vacuum holder for up to 12"-wide vacuum, and under-deck shelf, plus molded-in tool organizer on back. Full-size cabinet offers exceptional storage space and optional adjustable middle shelf. Compact, so requires less floor space and maneuvers easily in tight spaces. With commercial grade molded construction. Capacity (text) Capacity: 375 lbs.